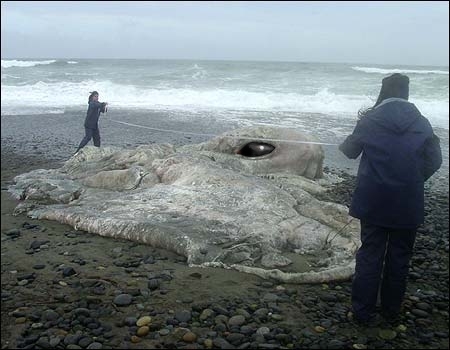 13 ton... thing washes ashore in Chile. According to this story, it was originally thought to be a beached whale. Now some people think it's an octopus (a 13 ton octopus?!). Whatever it is, the Kraken myths just got a bit easier to believe (even accounting for the two or so documented attacks on ships by giant squid). Further proof that we really don't have any idea what's in the seas. Hmmm... maybe I shouldn't have flushed that down the toilet when it was a baby. Mmmmm calamari... 13 tons... how much food do we ingest in a year? Wow. Look at the eyes on that thing Straight out of a SCI FI movie, if you ask me. The ocean is a bad place. There's been more than a few reported Krakens washing up somewhere. There spaced out between decent time intervals, but I have learned about these in my Mysteries of the Earth class I took last semester. ...but DAMN, would ya look at those eyes?! Eeesh. That Kraken myth is utterly believable, as long as you don't think of Harry Hamlin killing it. Big squids and octopi have been known for a long time now. I've read up a lot on the squids and, quite frankly, they're scary as crap. Big eating machines. Thank god they live so damn deep. The octopi are less understood though, and if that's what this is (it sure looks like one to me), it'll be the first one found in a long time, since possibly the late 1800's I think. And that 12 metre length and 13 ton weight is without legs. An octopus has longer legs than its body, although not as long as the squid. This thing could easily have been over 50 feet long. As for the Kraken, the Mediterranean has cuttlefish. Those have long bodies and shorter tentacles. But, before it was fished out and polluted, the Mediterranean had its own race of giant sea creatures. Probably not as big as the main ocean, but that's what the Kraken probably was. This is from the same 'thing' in Chile. A close up shows that is not as 'jelly' as the big picture looks, but it's hard and collageneus tissue. These two pictures below then are from the thing that was found in florida in the 1800s. Most of the articles I've read have been 'tweaked' now, more relying on the 'Giant Squid' theory, even though it only had the 'remains' of 1 tentacle. Sure, it could be a squid, we'll find out shortly when they finish the skin tests....OR...it could be entirely something else, we might never know. The Antarctic waters are full of cold-water-protein-enriched-larger-than-life species...why not this? Lord knows we know absolutely squat about the seas. And, yes, the eyeball above is fake. The enormous carcass was found partially buried in the sandy beaches of Anastasia Island of the coast of St. Augustine, Florida, on November 30, 1896. The exposed portion of the corpse was measured at 18 feet in lenght, and 7 feet in width. Upon digging and excavation, "arms" ranging from 25 to 32 feet were located, which increased speculation that the corpse was that of a giant octopus whose total length would have been over 100 feet. The eminent authority, A.E. Verill, a scientist known for his work in the discovery of the giant squid, named the specimen Octopus Giganteus. An intense debate ensued after various tissue sample analyses failed to positively identify the carcass. Contradictory reports surfaced in newspapers and academic journals. Most were confident the St. Augustine specimen was an octopus, others were certain it was an unidentifiable portion of a cetacean. In fact, Dr. Verill later changed his own mind and felt the carcass was just that of a badly decomposed whale. The carcass soon washed back out to sea, never to be found again. In 1957, original tissue samples were reexamined. Unfortunately the long storage period had severely decayed the samples. As a result, the tissue specimens no longer contained enough cellular materials to make a definite identification, however most of those who examined the tissues were of the opinion they did originate from a cephalopod, almost assuredly an octopus. Since this time, scores of reports of other encounters with what appears to be a giant octopus have been reported. From all the descriptions, the Lucsa, seen and rumored for years around the Bahamas is almost certainly an octopus of gigantic girth. Could this be possible? Might the Lucsa be, Octopus Giganteus? The area is right, the Bahamas lie only a whisper away from Florida, and St. Augustine. Perhaps the answer awaits us in the depths off Andros Island, or perhaps the answer lies, still floating, forever encased in a simple glass jar filled with formaldehyde on a shelf in Washington D.C.'s Smithsonian Institute. It's just a weather balloon, people. Move along, move along? For suitably wierd/amusing definitions of worthy. The image file name - "shoggoth.jpg" is a tip-off. Someone on the GURPS mailing list (where I got this) was having a little fun. So that's what they did with my foreskin. "Yeah, and it deep, too!" Damn, I wanted to be the first one with the Cthulhu reference. It's called Hedora. Godzilla battled and defeated it back in 71. I'm surprised it took this long for the carcass to wash ashore though. The vampire squid... it doesn't have suckers, it has spines. Nasty, nasty, nasty. That gives you all sorts of mental pictures doesn't it? Straight out of photoshop class you mean. The eye is fake. Look at the original photo. Looks kinda like shetline's soft bunny. Same gray color, similar looking dark glassy eye. The most likely explaination is that it is probably a gigantic aquatic mutant bunny that imploded under tremendous deep sea pressure and the fur was all worn away before he washed ashore. I re-upped with rivals for at least another month, so go ahead and use the old login to get your recruiting fix.